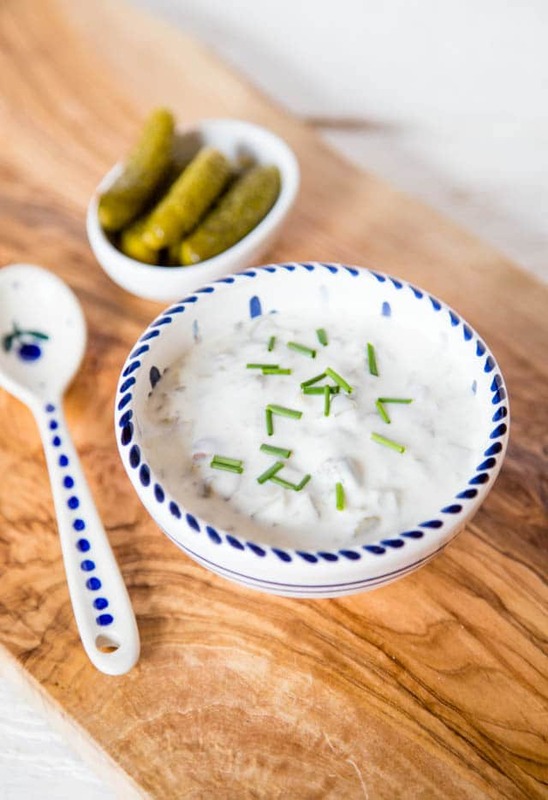 An easy recipe for homemade tartare sauce, with a clever twist to make it healthier and only 4 ingredients. Ideal to pair with chips. Vegetarian. Ed and I are generally creatures of habit. Every two or three weeks, come lunchtime, we’ll deem it a fish & chips day and Ed will whizz off on his Micro scooter to Bailey’s in Fulham (widely acknowledged for the excellence of their fish and chips), and come back with haddock and chips. Whilst he has gone I’ll lay the table, warm the plates and assemble all manner of condiments – after all fish & chips is mainly about the dips and sauces isn’t it? Fish and chips on a Friday is such a British tradition, it was served every friday at school and then at university. Once a week is far too much for us these days, but we do like our fish and chips when we have it. Tartare (or tartar in North America) sauce is a vital addition to our fish & chips, and I whip up a batch of sauce fresh every time. If you have leftovers pour them over some grated carrot and cabbage for a quick and easy ‘slaw. 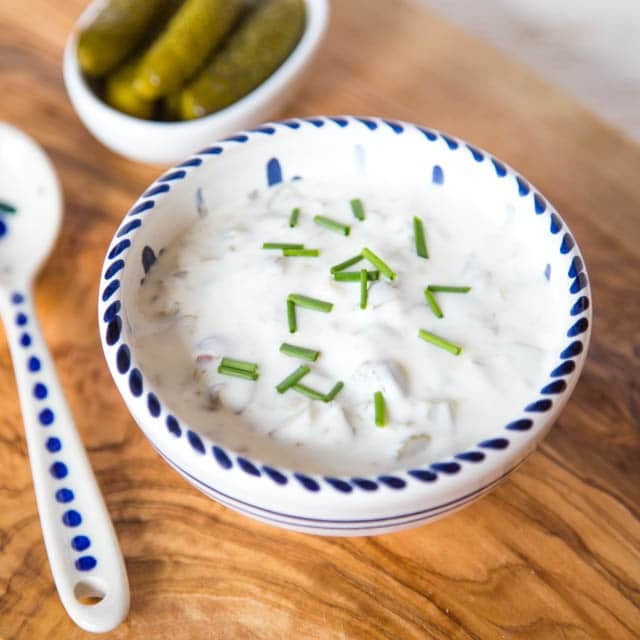 I discovered some years ago that you can thin mayonnaise down with yoghurt, to a ratio of about 1:2 without that much impact on the flavour but at the same time significantly reduces the calories. It is trick that I often use, you will find it in my healthy potato salad and my healthy Coronation chicken Fewer calories equates to more chips surely? If you try this Recipe: Quick & Homemade Tartare Sauce please tag #FussFreeFlavours on Instagram or Twitter. It is amazing for me when for me when you make one of my recipes and I really do love to see them. You can also share it on my Facebook page. Please pin this recipe to Pinterest too! Thanks for reading Fuss Free Flavours! 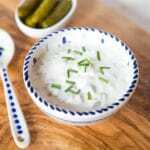 An easy recipe for tartare sauce, with a clever twist to make it healthier, and only 4 ingredients. Mayo, Yoghurt, capers and gerkins .Ideal to pair with vegetarian dip with fish and chips. Simply mix all the ingredients together, season to taste.